Our team is an interdisciplinary group composed of biology and mathematics subgroups collaborating between two different campuses, Missouri Western State University (MWSU) in St. Joseph, MO and Davidson College in Davidson, NC. 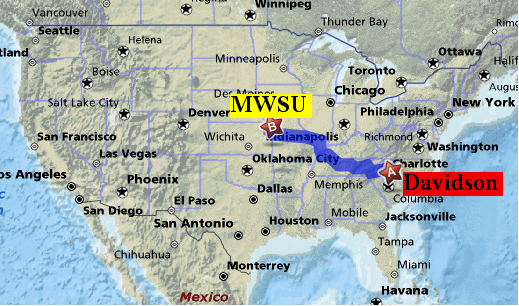 Davidson and MWSU are 1,032 miles/1,660 km apart, so our collaboration involves cyber meetings, wiki postings, Wiggio shared space, Skype communication, and two campus site-visits. During the first week of our 10 week project, Davidson students traveled to the Missouri Western campus for 5 days to determine what our project would be. During week 10, Missouri Western students traveled to Davidson to produce the wiki, PPT and poster. Our team is composed of 15 undergraduates, as neither campus has graduate students or postdocs. We have a variety of sophmores, juniors and seniors with majors in biology, chemistry, civil engineering, mathematics, as well as some who have not declared their majors yet. However we all share a common interest in synthetic biology research.